Superstar #SalmanKhan is leaving no stone unturned in promoting his brother-in-laws #AayushSharma and #WarinaHussain’s debut film #LoveYatri. The actor unveils a promotional video from the film on social media and expresses that it is for everyone who believes in love. The new video gives us a little sneak peek into the adorable fresh pairing on the silver screen – Aayush Sharma and Warina Hussian – and their different worlds. Aayush Sharma comes from a quintessential small town Gujarati background, who believes in love, Garba and having fun in life. Whereas Warina hails from England and learns about her culture through Aayush’s character and yes, falls in love too! 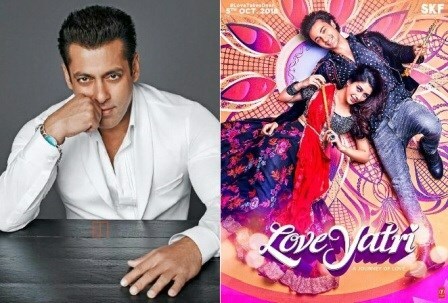 It is official; Salman Khan has just confirmed that his brother in law’s debut film Loveratri, will be released with a different name, Love Yatri! Directed by Abhiraj Minawala, Loveratri is a quintessential love story that has all the elements of a typical Bollywood film. The film is a romantic drama set against the backdrop of Navratri in Gujarat. Aayush stars as a Garba teacher from Baroda, who falls in love with an NRI, played by Warina, when she visits the town during the festival. Produced by Salman Khan's Salman Khan Films, the movie also stars Ronit Roy, Ram Kapoor, Arbaaz Khan and Sohail Khan in pivotal roles. The film releases on 5 October 2018.